I'm not sure if this belongs here. I'm looking to adopt a couple of crabs and came across someone selling 2 crabs on LetGo. He claims they were raised from eggs. I find that really hard to believe considering how difficult it is and mostly their current set up that houses the crabs now. He says they are a yr old. And he's selling them for $10 each. I offered 5 each. He turned me down. Do you think it's true? They are small and medium. By his description. Could they be that size in a year? Ask for proof - if he at least didn't take pics, I wouldn't believe him. Especially if he can take pics of the parents (and the tank, a good setup is usually a good sign that the crabs may of bred) or explain his process of how he raised the larvae. Edit: as for small/medium, it depends on what he considers small/medium. So tentative yes. That's really true - if he doesn't have a picture of them as tiny babies he's just making stuff up. "Technically" they were raised from eggs... HE/THEY just probably didn't do it!!! This is the pic of their current set up. Horrific for someone who should know better. I'm asking them for pics of their growing up. Yeah. And this is the transport pic going to the vet. I have a bunch of Strawberry Hermit Crab Eggs that are about to hatch! I'd be willing to bet the person had them for a year is all the truth in that add. You can take hermit crabs to the vet? I'm assuming they will have no idea hermits spawn. I had no clue until I came to the HCA. 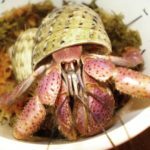 If we have expert crabbers on here that have difficult times breeding, AFTER having ideal crabitats for years. I find it very hard to believe some random guy has preformed that miracle. Last edited by Motörcrab on Fri Jan 18, 2019 9:47 pm, edited 1 time in total. Love those eggs! Lol. I asked him a couple of more questions. Got no reply. Offered again to pay $5/crab. Ok. I got a reply. The vet gave them calcium boosters. So I asked for the vet's name in case I needed help with my crabs. Oh my word - was that a serious picture that the person sent you of them going to the vet? Perhaps the person took the hermit crabs to the vet and the vet told him to give the hermit crabs more calcium. That looks like prepared food to me. I think the person is just really confused. Maybe he is selling them for someone. They were in those containers. He said they had proper ventilation. And apparently it's his dad that bred them. Oh well. I'll continue my look to adopt. Although I may break down and go to Petsmart. Is this an adult or 3 kids in a trenchcoat tryna sell some crabs?